There are three types of tariff amendments, which are administered by the Tariff Investigations Unit. These comprise investigations of increases in ordinary customs duties; reductions in ordinary customs duties; and the creation of rebate and drawback provisions. Besides the customs duty amendments, the Unit also administers various kinds of rebate and drawback provisions falling under Schedules 3, 4, and 5 of the Customs and Excise Act, 1964. This administration is done by issuing permits and certificates in accordance with the Customs and Excise Act, 1964, and setting guidelines for a variety of industrial sectors to clear imported goods, free of duty. Currently, the Tariff Investigations Unit administers one of the sectoral programmes, the Automotive Production Development Program (APDP), which succeeded the Motor Industry Development Program (MIDP) in January 2013. Tariffs are used as trade and industrial policy instruments whose key objective is to promote, in a complementary manner, domestic production, job retention and creation, and international competitiveness. In light of the pressing challenge of unemployment, the criteria for adjudicating tariff applications are applied in a manner that is sensitive to employment outcomes. Tariff investigations are done on a case-by-case approach and take into account the specific circumstances of the sector involved and the applications across the spectrum of the value chain. Tariff support is tied to conditions related to economic performance over time and is reviewed after a specified period. This means that tariff amendments are conditional on a commitment by beneficiaries on how they will perform against government’s set policy objectives. An increase in the rate of customs duties is considered for the purpose of granting relief for domestic producers that may be experiencing threatening import pressures to adjust and restructure so that in the medium to long term they could become internationally competitive without any support in the form of customs duty protection. This is made possible by the fact that there is a difference between the general applied rates and the WTO bound rates. The WTO bound rates act as a ceiling beyond which customs duty increases cannot go. A reduction or removal of duties is considered, in cases where intermediate goods, consumption goods, or capital goods are not manufactured domestically or unlikely to be manufactured domestically. A customs duty usually serves a protective purpose for an existing industry and in the absence of such an industry and if there is no potential or plans in place to grow that particular industry, then a reduction is considered, as the duty will otherwise only have a price raising effect. Linked to customs duties as a trade policy instrument are duty rebate and drawback provisions for products for which detailed separate tariff lines are impracticable for tariff administration purposes. The primary aim of these provisions is to provide a customs duty waiver and therefore an availability at world competitive prices of products that attract duties but are not produced or insufficiently produced domestically as an industrial or agricultural input for certain critical applications, as capital item, or as an agricultural product for consumption. Industry may also apply for a rebate or refund of duty on inputs used in goods destined for the export market. The rebate or refund of the duty levied on inputs used in exports is an incentive for allowing manufacturers to source their intermediate material and component inputs at world prices. Rebates and drawbacks form a key pillar of certain industrial development programmes, such as the APDP for motor vehicles. • Ad valorem duties: Ad valorem duties are expressed as a percentage of the free-on-board (FOB) value of the imported goods. The duty on such goods (for example 10%) is transparent to prospective investors or importers. • Specific duties: Specific duties are mostly expressed in Rand per kilogram or per unit. As the tariff lines have WTO-bound ceiling rates that are in all instances expressed in percentage terms as ad valorem duties, specific duties may in certain instances exceed the WTO-bound levels if not capped or carefully monitored. This is because the ad valorem equivalent of a specific duty varies from country-to-country, depending on the import price and from time-to-time, depending on the exchange rate. Specific duties are effective if protection against low-priced imports is necessary as is the case of distorted market for some agricultural products. In addition, it makes the customs evaluation work easier for Customs and Excise as the value of the imported goods is immaterial. • A combination of ad valorem and specific duties, as specified above. • Variable tariff formulae for selected agricultural products: For maize, wheat, and sugar, variable tariff formulae are in place that manifest as specific duties in the Tariff Book changing from time-to-time, depending on the changing variables in the recommended pricing formula. The variable tariff formulae take account of international price movements and duties are adjusted or triggered periodically without prior publication. These formulae operate on the premise that South African domestic prices should equal domestic prices in developed countries including the subsidies available to the producers there (world reference price) and then subtracting transport cost to South Africa from this reference price. This would afford South African producers a similar measure of price support compared to producers in developed countries. The difference between the current moving average global export price and the domestic reference price converted to Rand by a moving average R/$ exchange rate, is expressed as a specific duty to be levied on all imports. Tariff amendments are triggered by a quantum deviation in the moving average price. • Formula duties – formula duties consist of a normal or fair reference price, above which an ad valorem percentage duty would apply targeted against high-cost developed countries and below which, in addition to the ad valorem percentage duty, a progressive specific duty would apply against low-cost countries. International Trade Agreements, Bilateral, Multilateral and Regional Agreements (WTO, EU, EFTA, SADC and SACU) – it is important that customs duty amendments are in compliance with international agreements. Comprehensive criteria for adjudicating tariff applications have been set. The processes are transparent and consistently applied across all sectors based on information obtained through comprehensive questionnaires and on site verifications. The adjudication process is rigorous and evidence-based, and is carried out on a case by case basis considering the implications for the full value chain. The criteria are bounded by industrial policy objectives to promote domestic manufacture, job retention and creation, and international competitiveness. In light of the pressing challenge of unemployment, it is critical that the criteria are applied in a manner that is sensitive to employment outcomes. The principle of reciprocity is applied, varying from one sector to the other. This means that tariff amendments are conditional on a commitment by beneficiaries on how they will perform against government’s set policy objectives, including plans to increase production, investment and employment. j) The rate of effective protection. The list of factors is not exhaustive, nor can one or several of these factors necessarily give decisive guidance. 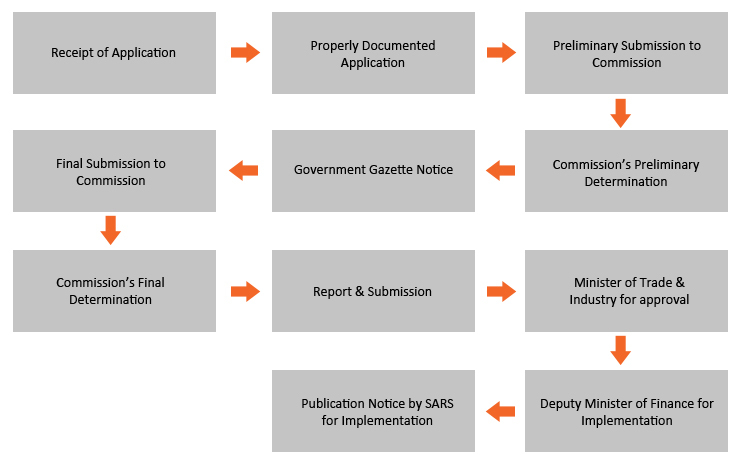 The tariff setting process for agricultural products has its own unique requirements, thus the investigations and recommendations give careful consideration to the agricultural products. Subsidies offered in a number of developed countries to their agriculture sector and their impact on global supply, have the effect of depressing world prices to the disadvantage of domestic farmers. This depression in world prices is factored into the equation when determining an appropriate level of the tariff. Not only the profitability and interests of primary producers are taken into account, but also those of value-added producers and the possible inflationary effects for the consumers of food, in particular the poor. The Commission carries out its investigations speedily and with rigour. The timelines have been revised to ensure speedy delivery of the instruments. It now takes the Commission generally four (4) months for sectors in distress and six (6) months for normal investigations. Different questionnaires/application forms for the three types of customs duty amendments can be obtained on this website; please click here.